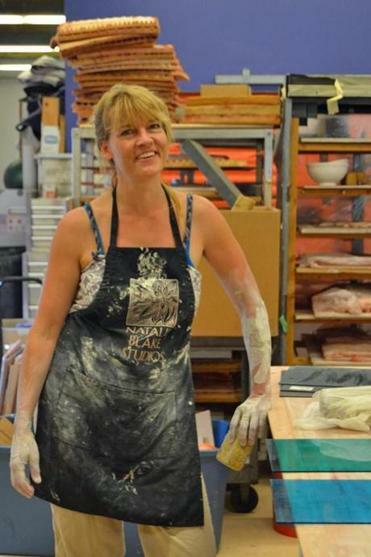 Ceramics and tile artist Natalie Blake at work at the Fulcrum Arts Center and Gallery in Brattleboro. 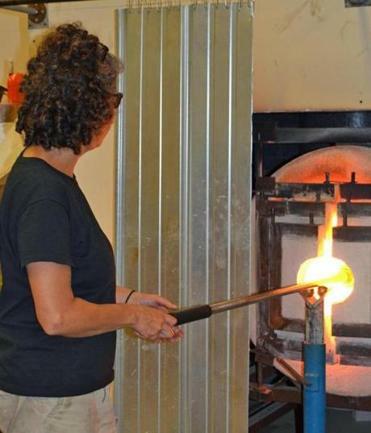 BRATTLEBORO — “I like to show people that it’s possible to make a living doing what you love,” said glass artist Randi Solin. We were in Solin’s studio at the Fulcrum Arts Center and Gallery in Brattleboro, watching her turn a steel blow pipe to gather glass from her 2,111-degree furnace. Solin smiled and chatted as she shaped the glowing orb with a chunk of wet, layered newspaper. “I love exposing people to art and letting them see the process behind it,” she said. There are lots of artists in this little corner of Vermont. Like many former industrial towns, Brattleboro needed something to fill its boarded-up, empty spaces, and its cheap real estate was a magnet for emerging artists. And artists attract more artists, looking for support and collaboration within a like-minded community. But Brattleboro’s artistic vein runs deep. It has long drawn writers and painters, including Robert Frost, Rudyard Kipling, Sinclair Lewis, Pearl Buck, Alexander Solzhenitsyn, and Wolf Kahn. This is home to Marlboro College, with its strong art program, Marlboro Music, an elite music training center and retreat, and the internationally renowned Marlboro Music Festival. It’s also home to the New England Youth Theater, which does a number of productions each year, The Brattleboro Music Center, with hundreds of programs and classes and more than 40 concerts a year, and the nearby Vermont Performance Lab, which offers contemporary dance and music residencies, and special community performances. “There’s a lot of artistic energy here,” says Danny Lichtenfeld, director of the Brattleboro Museum and Art Center. Add a slew of galleries and studios, along with courses, tours, festivals, and exhibitions, and it’s no wonder Brattleboro is consistently named one of the 10 best small art towns in America. Base yourself at the Latchis Hotel and Theater in downtown Brattleboro (50 Main St., 802-254-6300, www.latchis.com). The historic, Art Deco complex includes a funky and fun 30-room hotel (think: dark carpets and vintage baths) and four theaters, including a grand theater with Greek statues and a hand-painted mural ceiling, where you can watch first-run art and independent films, and catch a live performance. Start with a visit to the Brattleboro Museum & Art Center (10 Vernon St., 802-257-0124, www.brattleboromuseum.org). This bright and airy museum, housed in a former train depot, specializes in contemporary art, with monthly changing exhibitions. It’s small and friendly with a well thought-out mix. Recent exhibitions have included a collection of Jim Dine works, including the tile floor from one of the artist’s homes, and sculptures from Mexican-American artist Rodrigo Nava. Now, hit the street where you’re within easy walking distance to several galleries. Start with a visit to Vermont Artisan Designs (106 Main St., 802-257-7044, www.vtart.com), representing some 350 established and emerging artists. This longstanding gallery is like a well-curated museum with a wide range of work covering all mediums. Most of the work — about 70 percent — is from Vermont artists, and includes jewelry, furniture, sculpture, pottery, glass, textiles and paintings. Across the street is Gallery in the Woods (145 Main St., 802-257-4777, www.galleryinthewoods.com), specializing in fascinating and often surreal works by visual artists from around the world, and the Mitchell Giddings Fine Arts Gallery (183 Main St., 802-251-8290, www.mitchellgiddingsfinearts.com), a sleek and modern space showcasing contemporary artists. Award-wining glass artist Randi Solin works in her studio in Brattleboro. Brattleboro has another claim to artistic fame. The New England Center for Circus Arts (74 Cotton Mill Hill, 802-254-9780, www.necenterforcircusarts.com) is located at the Cotton Mill building just outside downtown. Ever thought of trying the flying trapeze, daredevil tumbling, or juggling? The center offers a variety of drop-in classes, or simply take a seat and watch one of the free recitals or performances that are held throughout the year. The massive former mill building is a community in itself, filled with about 60 artists, craftspeople and small businesses, including Tavernier Chocolates (don’t miss a stop here) and the Vermont Jazz Center, which hosts a variety of concerts and events. Consider timing your visit for the first Friday of the month, when Brattleboro hosts Gallery Walk (www.gallerywalk.org), the oldest community art walk in Vermont. The popular, year-round event, named a Yankee magazine editors’ choice, features more than 30 restaurants, cafes, inns, bed-and-breakfasts, museums, studios and galleries, with local artists’ exhibits, special events, and meet-the-artist receptions. The rural area surrounding downtown is classic Vermont: rolling hills and lush valleys, dotted with farm houses, rippled with streams, and home to several more artists’ galleries and studios. Drive scenic Route 30 to Fulcrum Arts (485 West River Road, 802-257-2787, www.fulcrumarts.com), where you can watch Solin’s live glassblowing, meet ceramics and tile artist Blake, and perhaps pick up your own work of art, or order a custom-made piece. All the Fulcrum Arts’ employees are artists, who also display their work in the small gallery space. You’ll find a collection of Solin’s beautiful glass works (her pieces are also in the White House, several embassies worldwide, and a slew of public and private spaces), samples of Blake’s exquisite tile work, along with furniture, jewelry, ceramics, photography and paintings. If time permits, you could check out artisans of a different kind: the Saxtons River Distillery is housed in the same building, offering tastes of its small-batch Vermont maple liquor, bourbon and rye. Don’t head home without making one more stop: the Robert DuGrenier Glass Art Gallery at Taft Hill (1096 Route 30, 802-365-4400, www.dugrenier.com). DuGrenier’s varied and magnificent glass pieces are on display and for sale in the rooms of a historic house. His work can be found throughout the world; he’s designed the flamboyant and beautiful red lobby chandeliers for the five-star Divan Istanbul hotel, the glass panel bar front for Wolfgang Puck’s Cut Restaurant in London, the Tiffany & Co. crystal logo and jewelry displays, Faberge perfume bottles, and Nickelodeon Kids’ Choice and MTV movie awards. Recently, he’s been perfecting handblown glass hermit crab habitats, mimicking the interior shape and contours of nature’s shells. There are large ones found in aquariums nationwide, but you can pick up one of DuGrenier’s small, crystal “crabitats” for under $20. Who can resist?